Dr. Rick Thorne (PhD 1999) is a postdoctoral researcher sponsored by the HMRI Cancer Research Program and contracted lecturer in the School of Biomedical Sciences & Pharmacy at the University of Newcastle. His major interest involves different families of cell adhesion molecules and how these engage signalling pathways, particularly how these contribute to the development and progression of cancer. These interests overlap with CD36, another signalling molecule with disease functions outside cancer, particularly the metabolic syndrome and related disorders such as diabetes. Dr. Thorne has over ten years postdoctoral experience beginning with the award of a two year competitive postdoctoral fellowship Brawn Postdoctoral Research Fellow undertaken at the UoN under Prof. Gordon Burns. During that period he was awarded two competitive overseas training schemes through the UICC, an International Cancer Technology Transfer Fellowships undertaken at the ICRF in London, UK (2000) and a Cancer Research Training Course held in Toronto, Canada (2001). Pursing further training he then relocated the UK to take up a three year post as a Postdoctoral Fellow in Training (2002-2004) at the 5* Institute of Cancer Research (ICR, London). This appointment also led to a number of quality publications and first-hand experience as a PhD supervisor and supervisor of graduate student projects for Imperial College (honours equivalent). Following the ICR appointment he returned to UoN under an ARC Australian Postdoctoral Fellowship awarded from 2004-2007 in connection with an ARC Discovery Project. Subsequent to this award he received a three year Cancer Institute NSW fellowship for the period 2008-2010. After a number of years acting as laboratory manager for the Cancer Research Unit, Dr. Thorne inherited the facilities’ of Prof. Burns and now runs this laboratory on an independent basis. Over the last five years Dr. Thorne has contributed 27 original research articles and one review article. For ten of these publications he is the first, equal contributory or senior author. Within this body of work there is a strong indication of productive collaborations with local, national and international colleagues. I have been working in laboratory-based science for nearly twenty years with direct hands on experience in vast array of techniques. I have a strong interest in the technical aspects of science, and have been instrumental in obtaining key equipment for my own research work and for the greater benefit of my research colleagues. Molecular Biology: All DNA manipulations associated with the construction of expression vectors including epitope tagged molecules, fusion proteins, mutants and chimeras, recombinant adenoviruses. DNA and RNA preparation and analysis by southern and northern blotting, PCR, screening assays for cDNA libraries, yeast-2-hybrid assays etc. Protein analysis and biochemistry: SDS-PAGE, 2D gels, immunoprecipitation, GST-pulldown, immunoblotting, use of radioisotopes, kinase assays, metabolic labeling studies, N-glycan analysis, chromatographic and related biochemical methods, flow cytometry, ELISA assays, protein and enzyme assays. Imaging: I have developed and manage a microscope facility consisting of a trio of three Zeiss microscopes freely available to all subject to appropriate training. All utilise a common software package (Axiovision) that helps in training of users. I have a great deal of experience in immunofluorescence and confocal microscopic imaging. The Axioplan 2 is a standard upright miscroscope equipped with colour and monochrome cameras, Apotome imaging device, Colibri 2 illumination system. This is powerful system fitted with a large number of epifluorescence filter sets and high performance objectives. This system is adaptable to almost any specimen on a slide. The Axiovert 200 is a manual inverted fluorescence microscope fitted with a high resolution monochrome camera. Suitable for general work using cultured cells. The Cell Observer System is for live cell imaging and more complex scanning tasks. It consists of an automated inverted microscope with scanning stage and an integrated incubator system. Cell culture and in vitro assays: derivation and maintenance of cell lines, cryopreservation, mycoplasma screening, cell transfection methods, cloning and cell sorting, production and characterization of monoclonal antibodies, cell adhesion, migration and chemotaxis assays, drug toxicity, apoptosis, phagocytosis and cell-mediated immunity assays. In vivo models: I have developed experimental models for cancer metastasis and immunoscintography in human xenograft models of melanoma, and experimental chemotherapy protocols for an rodent model of acquired drug-resistance in mammary cancer. © The Author(s) 2019. The TP53 gene product, p53, is a pleiotropic transcription factor induced by stress, which functions to promote cell cycle arrest, apoptosis and senescence. Genome-wide profiling has revealed an extensive system of long noncoding RNAs (lncRNAs) that is integral to the p53 signalling network. As a research tool, we implemented a public access database called TP53LNC-DB that annotates currently available information relating lncRNAs to p53 signalling in humans. © 2016, Spandidos Publications. All rights reserved. Non-alcoholic fatty liver disease (NAFLD) is an inflammatory condition caused by hepatic lipid accumulation that is associated with insulin resistance, diabetes and metabolic syndrome. Although statins should be used with caution in liver diseases, they are increasingly investigated as a possible treatment for NAFLD. The present study recreated an in vitro model of NAFLD using HepG2 cells exposed to oleic acid (OA), which was used to quantify OA-induced lipid accumulation in HepG2 cells treated with various concentrations of simvastatin. In addition, the effect of simvastatin on HepG2 cell morphology and microparticle generation as a marker of cell apoptosis was assessed. OA-induced lipid accumulation was quantified by Oil Red O staining and extraction for optical density determination. Stained lipid droplets were visualized using phase contrast microscopy. Furthermore, HepG2 cell-derived microparticles were counted by flow cytometry subsequent to staining for Annexin V. HepG2 cells treated with 0-1 mM OA showed dose-dependent lipid accumulation. Treatment of HepG2 cells with increasing concentrations of simvastatin followed by treatment with 1 mM OA showed that low simvastatin concen- trations (4-10 µM) were able to reduce lipid accumulation by ~40%, whereas high simvastatin concentrations (20 and 30 µM) induced apoptotic changes in cell morphology and increased the production of Annexin V+ microparticles. This suggests that low simvastatin doses may have a role in preventing NAFLD. However, further investigations are required to confirm this action in vivo and to determine the underlying mechanism by which simvastatin reduces hepatic steatosis. © 2015 Springer Basel. The Hippo pathway is emerging as a critical nexus that balances self-renewal of progenitors against differentiation; however, upstream elements in vertebrate Hippo signalling are poorly understood. High expression of Fat1 cadherin within the developing neuroepithelium and the manifestation of severe neurological phenotypes in Fat1-knockout mice suggest roles in neurogenesis. Using the SH-SY5Y model of neuronal differentiation and employing gene silencing techniques, we show that FAT1 acts to control neurite outgrowth, also driving cells towards terminal differentiation via inhibitory effects on proliferation. FAT1 actions were shown to be mediated through Hippo signalling where it activated core Hippo kinase components and antagonised functions of the Hippo effector TAZ. Suppression of FAT1 promoted the nucleocytoplasmic shuttling of TAZ leading to enhanced transcription of the Hippo target gene CTGF together with accompanying increases in nuclear levels of Smad3. Silencing of TAZ reversed the effects of FAT1 depletion thus connecting inactivation of TAZ-TGFbeta signalling with Hippo signalling mediated through FAT1. These findings establish FAT1 as a new upstream Hippo element regulating early stages of differentiation in neuronal cells. The vertebrate Fat cadherins comprise a small gene family of four members, Fat1-Fat4, all closely related in structure to Drosophila ft and ft2. Over the past decade, knock-out mouse studies, genetic manipulation, and large sequencing projects has aided our understanding of the function of vertebrate Fat cadherins in tissue development and disease. The majority of studies of this family have focused on Fat1, with evidence now showing it can bind enable (ENA)/Vasodilator-stimulated phosphoprotein (VASP), ß-catenin and Atrophin proteins to influence cell polarity and motility; HOMER-1 and HOMER-3 proteins to regulate actin accumulation in neuronal synapses; and scribble to influence the Hippo signaling pathway. Fat2 and Fat3 can regulate cell migration in a tissue specific manner and Fat4 appears to influence both planar cell polarity and Hippo signaling recapitulating the activity of Drosophila ft. Knowledge about the exact downstream signaling pathways activated by each family member remains in its infancy, but it is becoming clearer that they have tissue specific and redundant roles in development and may be lost or gained in cancer. In this review, we summarize the recent progress on understanding the role of the Fat cadherin family, integrating the current knowledge of molecular interactions and tissue distributions, together with the accumulating evidence of their changed expression in human disease. The latter is now beginning to promote interest in these molecules as both biomarkers and new targets for therapeutic intervention. © 2013 Wiley Periodicals, Inc.
Elucidation of the molecular mechanisms by which 5-fluorouracil (5-FU) induces apoptosis is required in order to understand the resistance of colorectal cancer (CRC) cells to 5-FU. In the current study, 5-FU-induced apoptosis was assessed using the propidium iodide method. Involvement of protein kinase C (PKC) was assessed by evaluating the extent of their activation in CRC, following treatment with 5-FU, using biochemical inhibitors and western blot analysis. The results revealed that 5-FU induces varying degrees of apoptosis in CRC cells; HCT116 cells were identified to be the most sensitive cells and SW480 were the least sensitive. In addition, 5-FU-induced apoptosis was caspase-dependent as it appeared to be initiated by caspase-9. Furthermore, PKCe was marginally expressed in CRC cells and no changes were observed in the levels of cleavage or phosphorylation following treatment with 5-FU. The treatment of HCT116 cells with 5-FU increased the expression, phosphorylation and cleavage of PKCd. The inhibition of PKCd was found to significantly inhibit 5-FU-induced apoptosis. These results indicated that 5-FU induces apoptosis in CRC by the activation of PKCd and caspase-9. In addition, the levels of PKCd activation may determine the sensitivity of CRC to 5-FU. © 2014 Oliveira et al. ; licensee BioMed Central Ltd. Background: Macrophage migration inhibitory factor (MIF) is a widely expressed cytokine involved in a variety of cellular processes including cell cycle regulation and the control of proliferation. Overexpression of MIF has been reported in a number of cancer types and it has previously been shown that MIF is upregulated in melanocytic tumours with the highest expression levels occurring in malignant melanoma. However, the clinical significance of high MIF expression in melanoma has not been reported. Methods: MIF expression was depleted in human melanoma cell lines using siRNA-mediated gene knockdown and effects monitored using in vitro assays of proliferation, cell cycle, apoptosis, clonogenicity and Akt signalling. In silico analyses of expression microarray data were used to correlate MIF expression levels in melanoma tumours with overall patient survival using a univariate Cox regression model. Results: Knockdown of MIF significantly decreased proliferation, increased apoptosis and decreased anchorage-independent growth. Effects were associated with reduced numbers of cells entering S phase concomitant with decreased cyclin D1 and CDK4 expression, increased p27 expression and decreased Akt phosphorylation. Analysis of clinical outcome data showed that MIF expression levels in primary melanoma were not associated with outcome (HR = 1.091, p = 0.892) whereas higher levels of MIF in metastatic lesions were significantly associated with faster disease progression (HR = 2.946, p = 0.003 and HR = 4.600, p = 0.004, respectively in two independent studies). Conclusions: Our in vitro analyses show that MIF functions upstream of the PI3K/Akt pathway in human melanoma cell lines. Moreover, depletion of MIF inhibited melanoma proliferation, viability and clonogenic capacity. Clinically, high MIF levels in metastatic melanoma were found to be associated with faster disease recurrence. These findings support the clinical significance of MIF signalling in melanoma and provide a strong rationale for both targeting and monitoring MIF expression in clinical melanoma. Background: A useful application of flow cytometry is the investigation of cell receptor-ligand interactions. However such analyses are often compromised due to problems interpreting changes in ligand binding where the receptor expression is not constant. Commonly, problems are encountered due to cell treatments resulting in altered receptor expression levels, or when cell lines expressing a transfected receptor with variable expression are being compared. To overcome this limitation we have developed a Microsoft Excel spreadsheet that aims to automatically and effectively simplify flow cytometric data and perform statistical tests in order to provide a clearer graphical representation of results. Results: To demonstrate the use and advantages of this new spreadsheet method we have investigated the binding of the transmembrane adhesion receptor CD44 to its ligand hyaluronan. In the first example, phorbol ester treatment of cells results in both increased CD44 expression and increased hyaluronan binding. By applying the spreadsheet method we effectively demonstrate that this increased ligand binding results from receptor activation. In the second example we have compared AKR1 cells transfected either with wild type CD44 (WT CD44) or a mutant with a truncated cytoplasmic domain (CD44-T). These two populations do not have equivalent receptor expression levels but by using the spreadsheet method hyaluronan binding could be compared without the need to generate single cell clones or FACS sorting the cells for matching CD44 expression. By this method it was demonstrated that hyaluronan binding requires a threshold expression of CD44 and that this threshold is higher for CD44-T. However, at high CD44-T expression, binding was equivalent to WT CD44 indicating that the cytoplasmic domain has a role in presenting the receptor at the cell surface in a form required for efficient hyaluronan binding rather than modulating receptor activity. Conclusion: Using the attached spreadsheets and instructions, a simple post-acquisition method for analysing bivariate flow cytometry data is provided. This method constitutes a straightforward improvement over the standard graphical output of flow cytometric data and has the significant advantage that ligand binding can be compared between cell populations irrespective of receptor expression levels. © 2004 Tzircotis et al; licensee BioMed Central Ltd. 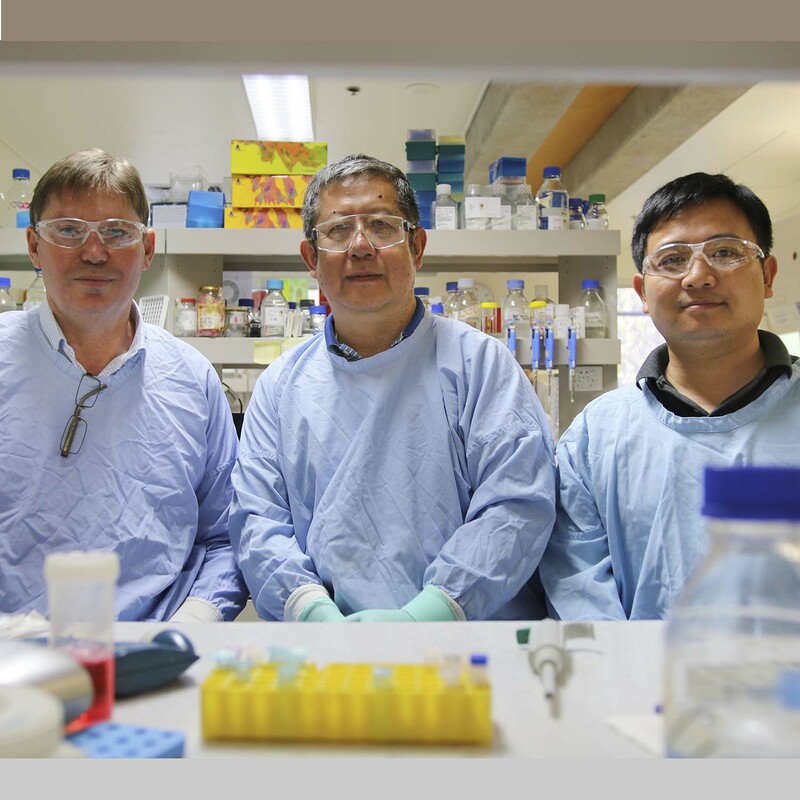 The search for new pathways to treat melanoma has unearthed a molecular target that may play role in tumour growth, according to UON researchers.